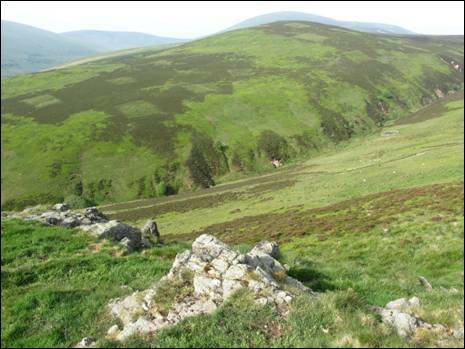 A close examination of the Ordnance Survey map of the Cheviot Hills in and around the immediate Harthope Valley area reveals a large number of named crags; Hawsen, Housey, Long, Langlee, Middleton, Tathey, Steel, Lamb, Carling and Steely. Some, perhaps as a consequence of their prominence and relative ease of access, are better known than others such as the ever-popular Housey Crags and the Chevy Chase-visited Langlee Crags. Others, smaller in scale and slightly more difficult to reach, are by and large off the radar of most visitors to the area. On this delightful circular walk you will visit a selection of these fine crags on a journey that will take you to both sides of one of Northumberland`s most beautiful and popular valleys offering you along the way wide-angle views of the surrounding hills. When you have finally completed this superb round of crags your resolve to visit the remaining rocky outcrops in the area will have been well and truly sharpened. 1. In his 1950-published booklet, `A Guide to the Cheviot Hills`, F. R. Banks described the road from Wooler to the Harthope Valley as going, “through the farmstead of Earle to Middleton Hall where it bears right into a rough road up a steep hill”. If you have been this way before you will most certainly recognize the description of the narrow and bumpy uphill stretch of road through a tunnel of trees which ultimately leads you to the cottage of Skirl Naked where, once again in the words of F. R. Banks, “the road descends abruptly to the valley foot”. Indeed it does and from there it continues through the valley, first crossing the Carey Burn and then, almost unnoticed, the thin trickle of the Backwood Burn eventually passing the cottage of Langlee, standing on the opposite side of the Harthope Burn. “The deep rent in the hillside beyond the farm of Langlee is known as Easter Dene”, wrote F. R. Banks adding, “and farther up appear the rocky tors of Housey Crag and Long Crag”. Those with a keen eye for detail will notice that whilst F. R. Banks described Housey and Long as each being a singular `crag` this has now been changed, compliments of the Ordnance Survey folk, to the plural `crags` and also Banks` spelling of `dene`, as in Easter, has been transformed into the more unusual spelling of `dean`. This is the point where you must now cease your vehicular progress and park your car on the small grassed area on the left hand side of the road (GR NT963232) adjacent to the track leading to the bailey bridge which spans the burn and serves the cottage of Langlee. This bridge will also provide the means by which you will keep your feet dry at the end of the walk. Once you are sensibly parked and have your sac slung over your shoulders it is time to head back down the valley road keeping, as you retrace your tyre tracks, a watchful eye for the odd vehicle that may pass your way. 2. The relatively flat road makes for a pleasant start to your walk as you travel down the valley parallel to the Harthope Burn over to your right. 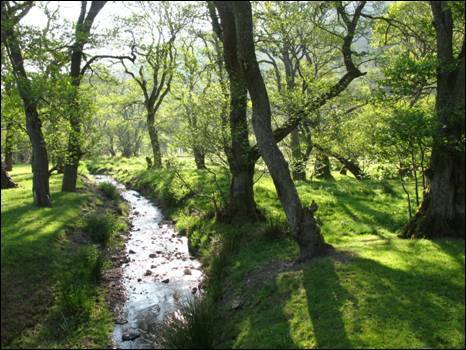 After less than 450 metres you will cross the delightful Backwood Burn as it slips beneath the road and winds its way through beautiful deciduous woodland towards the burn a short distance away. Soon you will break free from the trees and after 1 kilometre of walking after leaving your car you will see, on the left hand side of the road, a small stile with an adjacent signpost indicating, `Cold Law 1¼` (GR NT969241). This is your route upwards so, with a jaunty swing of the leg, step over the stile and follow the clear and part-sunken track towards higher ground. Soon the views begin to broaden as first the conical-shaped Hedgehope Hill and the stone fist of Housey Crags appear further up the valley quickly followed by the prominent twin outcrops of Langlee Crags standing high above Langlee cottage and separated by the deep and impressive cleft of Easter Dean. Continue to keep with the track and, as you reach the 300 metre contour, you will spot what might appear from a distance to resemble a part-tilted headstone of some ancient way-farers lonely grave. However, once you are up close and personal with the stone you will realise that it is just an old boundary stone bearing the initials `SH` on one side. You will pass a number of these boundary stones as you make your way between this point and Hawsen Crags so keep your eyes well and truly peeled. Now cross over the nearby post and wire fence via the step stile (GR NT959240) or go through the adjoining small gate and, ignoring the marker arrow attached to the stile, follow the fence straight up the heather-covered slope. A modicum of a path will help you on your way. 3. Eventually, you will reach a facing fence and another small stile. Cross over and turn right along a well-used if somewhat muddy track for a short detour to Carling Crags which lie to your left little more than 100 metres further on. These are the least significant crags of your day out although they are worth visiting for both the record and the pleasant backcloth of the Cheviot heartland. Once you have had a wander around this rocky outcrop retrace your steps and then continue to keep with the fence as far as the first gate on your left. Clamber over the gate and turn immediately right, following the fence uphill passing, as you climb, some small unnamed crags on your right. As the gradient eases, leave the fence briefly behind and follow the thin path cutting away to your left which leads you quickly to the triangulation pillar on the summit of Cold Law (GR NT953238). Standing at a height of 452 metres (1483 feet) above sea level this is the highest of the hills which occupy the north eastern corner of the Northumberland National Park and, as such, the views are wide and far-reaching. Take a moment to enjoy your visit to this more-often-than-not windswept top before continuing a short way along the thin path as far as the fine walker`s cairn where you will be greeted by splendid views into the Harthope Valley. Now return to the fence, turn left and enjoy the straight-line 1 kilometre easy walk as far as a clear gravel track where you will find two gates through the fence you have been following on your right (GR NT944233). There is also a small adjacent stile. 4. Through the gates, the track leads to the former cottage of Broadstruther, now refurbished and utilised for grouse shooting parties, whilst to the left the track heads downhill to the Harthope Valley following, away to the right, the course of the Hawsen Burn. This track is your immediate route but before rampaging downhill note the boundary stone standing close to the post and wire fence just beyond the gates. Now it is time to make your way downhill by turning left and following the track for approximately 200 metres. As you go, keep looking for a green track on your left running uphill and passing some grouse butts en route to Hawsen Crags. Once you have reached this green track make your way gently uphill for yet another short detour on your crag-littered route around the Harthope Valley. These are the lowest, by a proverbial whisker, of all the crags you will visit on your walk although they are none the worse for that. At 311 metres (1020 feet) high these crags offer fine views down to the Hawsen Burn, across to Blackseat Hill and Hedgehope Hill and over the valley to your next port-of-call, Housey Crags. 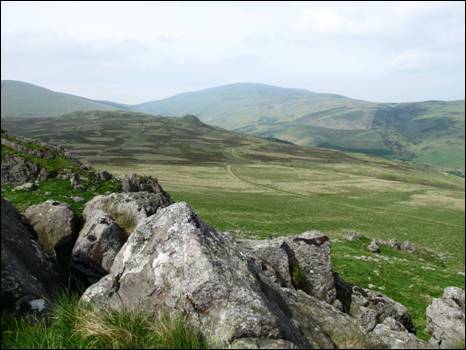 In his lovely book, `The Cheviot Hills A Sense of Wilderness`, published in 2003 Tony Hopkins listed Hawsen Crags as one of his six favourite crags and outcrops in the Cheviot Hills a list which also included the next crags on your agenda, Housey Crags. A kind of `buy one favourite crag, get another one free`! As soon as you are satisfied that you have seen all there is to see retrace your boot steps as far as the gravel track, turn left and continue your downhill journey. The surface is good so progress will be swift. As you descend and the Harthope Valley draws near watch out for a thin path on your left together with an adjacent marker post. They are both easy to miss. At this point leave the main track behind and follow the path, which is the map-marked public bridleway, through deep heather to reach a small rise above the Harthope Valley. Descend the rise to reach a fine circular sheep stell (GR NT953225) close to the Hawsen Burn. 5. You have now arrived back in the Harthope Valley, your second visit of the day and slightly upstream from where you parked your car, although it is an extremely fleeting visit. 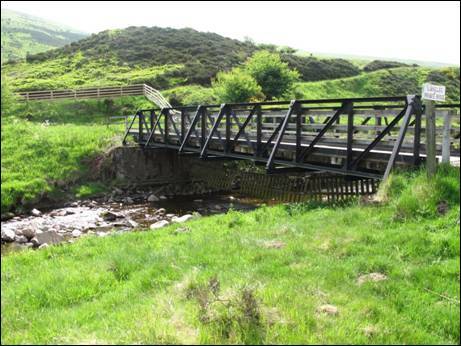 Now turn to your right, cross over the small road bridge under which the Hawsen Burn flows and then turn immediately left following the sign which indicates, `Housey Crags ½ Hedgehope Hill 2½ Harthope Linn 3½`. With a stone wall on your right head gently downhill, cross over the Harthope Burn via a small footbridge and then, after keeping with the rising path, emerge out of the trees into full daylight. Your route now heads fairly sharply uphill following a clear, green path towards the-more-than-obvious grey stone of Housey Crags avoiding, as you go, the distraction of any side track or path. Simply keep ever upwards and the path will ultimately lead you behind the crags although, before you reach that point, you will undoubtedly have paused from time to time to admire the view of the valley you recently left behind. 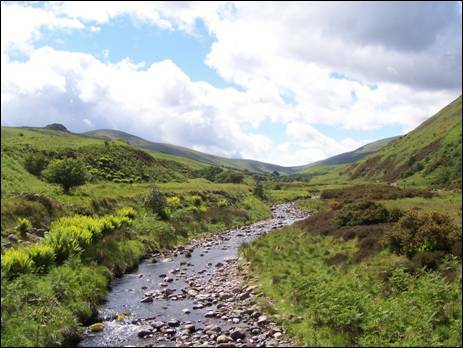 “Beautiful, lonely valley running deep into the heart of the Cheviot Hills”, is how Geoffrey N. Wright described the valley in his 1989 book, `The Northumbrian Uplands` adding that it was, “formed by a geological fault and smoothed by glacier action”. Once you are behind the crags you will find it difficult to resist the temptation to carefully scramble to the top most point of these popular crags from where you will enjoy superb views across the valley to the mighty bulk of The Cheviot. 6. When you have finally finished with Housey Crags it is time to make yet another short detour this time to visit your fourth and penultimate set of crags of the day. So, having descended from your scramble and, with the crags behind you, turn right and continue with the path which takes you over nearby Long Crags. 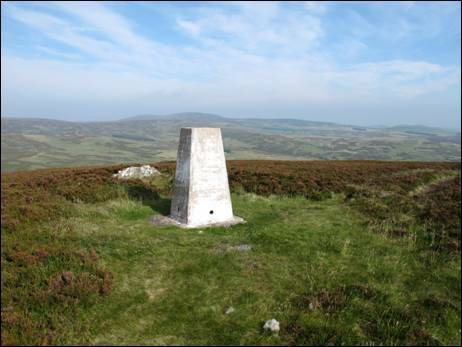 Proceed as far as the highest point (GR NT956213) where you will see the conical-shaped Hedgehope Hill in all its glory rising out of Kelpie Strand. 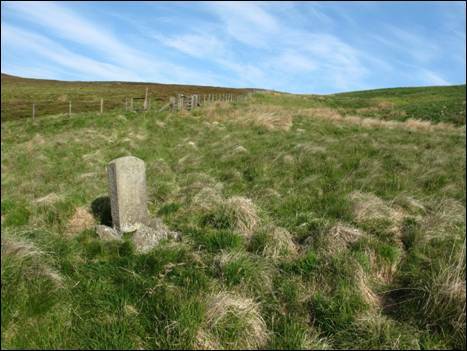 “The way up Hedgehope Hill”, wrote Ann Sitwell in her 1948 book, `Northumberland`, “is through the valley of the Harthope Burn running between Cheviot and Hedgehope through grassland, bracken and birch trees, green and silver in spring and summer, golden and russet in autumn”. Who are we, these 65 years later, to argue with such an apt description? 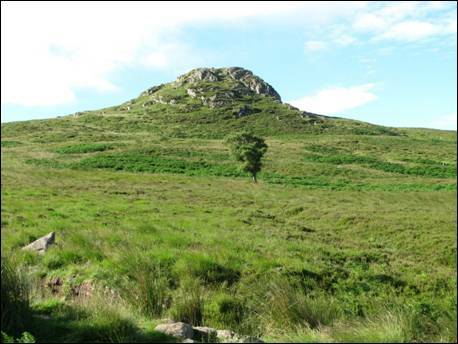 Now return to Housey Crags and then continue a short distance downhill until you reach a gravel track. At this point, turn right and enjoy the easy amble along the firm surface which eventually brings you to a five bar gate with an adjoining stile. Continue through and then, after a further 400 metres, take the green track which cuts off to your right. Do not rush off along this track as you must now keep a close eye out for the thin trace which, almost immediately, wanders off to your half-left. Follow this towards the crags and when this finally disappears you will need to pick your own way through the jumble of rocks to reach the superb Langlee Crags (GR NT966220). 7. These crags cover a fairly large area of ground so be sure to make your way to the two most prominent ones. As with Housey Crags earlier you will inevitably want to scramble to the highest point of one of these rocky fists and once you are sitting comfortably, legs stretched out in front of you, you can enjoy a splendid view towards the head of the Harthope Valley where the area`s two most iconic hills, Hedgehope Hill and The Cheviot, stand side by side. The thin blue line of the Northumberland coast, to the east, can also be spotted by a particularly keen eye on a clear day. These are the final crags you will visit on the walk so take full advantage of your elevated position and have a leisurely lunch. Once done, it is time to begin your 3.5 kilometre wander back to the valley floor. Just behind the two main crags there is a thin path which you need to follow northwards and, as you progress along this path whilst descending easily, you will see in front of you a gravel track. You are aiming for this and as soon as you have reached it turn to your right. Very soon you will arrive at a junction with another track (GR NT971223) at which point you must turn left. Now follows an arrow-straight section of walking over relatively level grassland on a firm track with a central green strip. In spring and summer these grasslands are usually an excellent place to curlew-spot so keep an ever-watchful eye. 8. In time, you will reach a multi-arrowed marker post on your right (GR NT973237) and this is your cue to leave the higher ground behind. Turn left, virtually back on the way you came, and begin to head downhill towards the cottage of Langlee which can soon be seen some way ahead. As you wander downhill you will have an excellent view of the Harthope Valley with the road and burn weaving patterns along the valley floor and Hedgehope Hill and the mighty Cheviot rising steeply in the distance. The path turns around the front of Langlee cottage after which it then joins a track leading down to the bailey bridge mentioned at the beginning of the walk. A bailey bridge is a type of portable, pre-fabricated, truss bridge which was developed by the British during the 1939-45 War for use by both the British and American military. The wood and steel elements are small and light enough to be carried by trucks and then lifted into place by hand without the use of a crane. They require no special tools or heavy equipment to construct and, to this day, continue to be used in civil engineering projects and to provide temporary river crossings. This one has been in place for a number of years and appears to have become a more permanent feature of the valley. It looks completely at one with the Cheviot landscape. On the other side of the bridge stands your car so make your way across this fine structure, pausing in the middle to take a final look at a classic view up the valley and to reflect on your crag-littered taster of a walk. Below Langlee Cottage, Harthope Valley (GR NT963232), (GR NT969241), (GR NT959240), (GR NT953238), (GR NT944233), (GR NT953225), (GR NT956213), (GR NT966220), (GR NT971223) & (GR NT973237).